LOL! 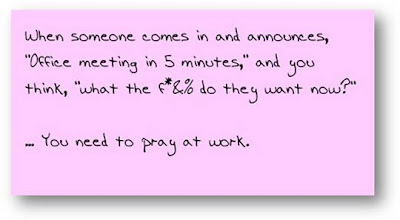 Your post-its say it all and the only prayer i would like to add is "hold me back!" TGIF! and have a great weekend!!!! But can you imagine (just sit back and close your eyes) a day when you actually CUT LOOSE and SAY all the things you're thinking? Ahhhhhh. Free at last. Free at last. What doesn't kill us only serves to give us get ulcers and an odd eye twitch. That was awesome! Happy Friday! 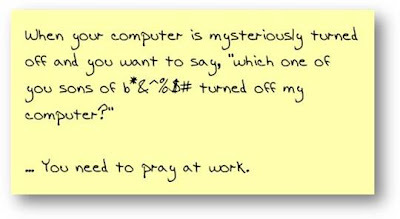 How did you get my post it notes from my previous job??? 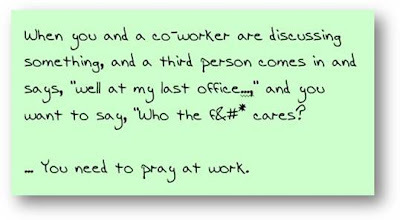 Oh and the one about the happy co-worker, that's my friend. She would come in SINGING a happy tune EVERY flippin morning. 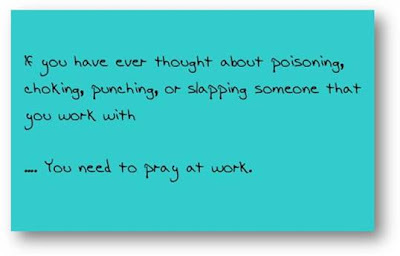 The one in the office we all wanted to kill (because she kissed a** and acted like the boss even though she was the last hired) always would remark "that b**** needs to shut up. And when I went on vacation, no one touched my desk. They just let it pile up because no one knew how to do my job. When I went on medical leave they all had strokes and were calling me every 5 minutes after I got home from the hospital. Finally after 6 months of bothering me at home, when they thought they could let me go, they stopped calling. Turns out they couldn't and I went on ltd. I don't miss that job. I miss the money though. LMAO...does this apply if you sub teach??? You're so funny... love this post! 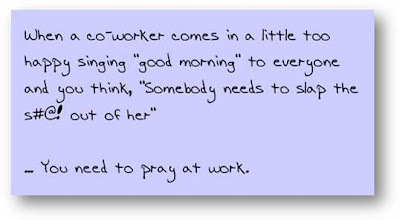 And, I don't work in an office but all that applies to SAHM's too! Awesome! I'm with you on this! 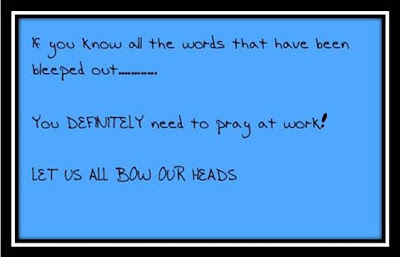 Oh my STARS...I'm going to have to be praying ALL THE TIME. I'll never get any work done! That was like reading my thoughts. Too true!! I'll second, third, and fourth that sister. And amen. 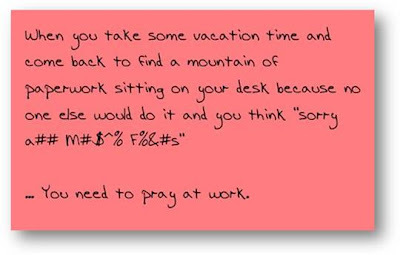 I should have done A LOT of praying back when I used to work then. A LOT. 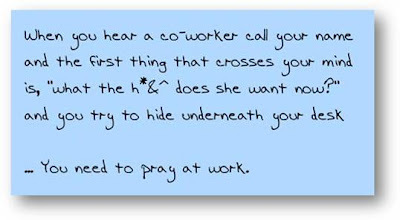 I soooo need to pray at work! 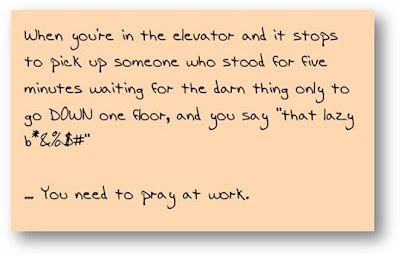 One of my fellow law clerks sent me an email with that in it one day at my old job. I printed it out and kept it in my drawer because every last one of them applied. 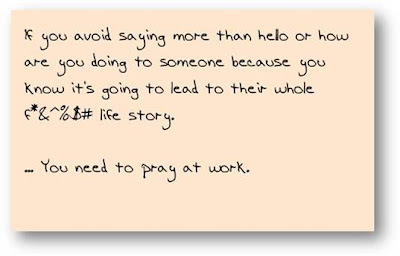 (Yes, I needed to pray a lot.) When I quit, I forgot to grab the email. I'm glad to see it reprinted here again. It's still just as funny as the first time I read it. Based on this info, I should be praying 24/7. How will I ever have time for anything else? 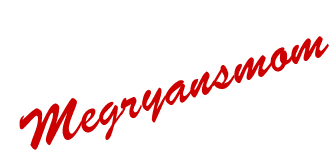 Your blog is the funniest ting I've read in a long time!!! I am SO putting you on my blog roll right.this.second.